The Wired Equivalent Privacy (WEP) key is an encryption that can be a 64-bit key with 10 hexadecimal digits or a 128-bit WEP key with 26 hexadecimal digits. 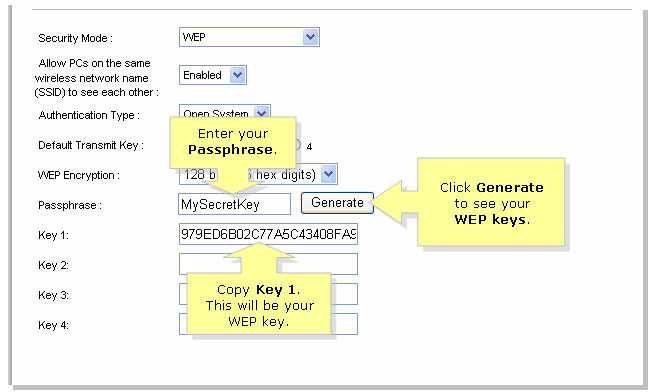 This will prevent other users from connecting to a wireless network using your own WEP key. It will also protect your wireless transmissions/communications from being accessed or received by other users. To set up a 128-Bit WEP Wireless Security on your Linksys router, follow the steps below. NOTE: To learn how to access your router’s web-based setup page using a Mac® computer, click here. 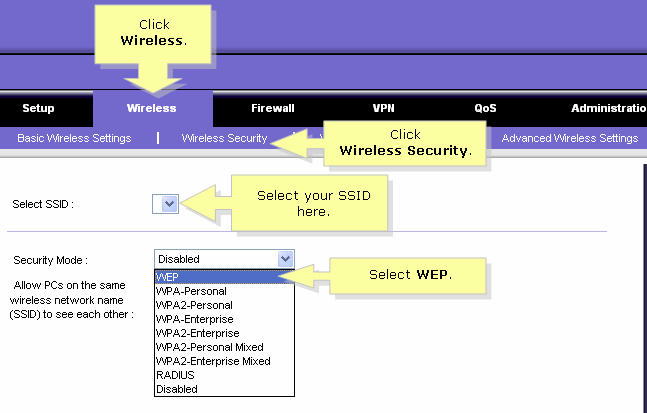 On the router’s web-based setup page, click the Wireless > Wireless Security. On the Security Mode section, select WEP. Select any number under the Default Transmit Key to determine which key you’ll be using. In this example, we selected number 1. 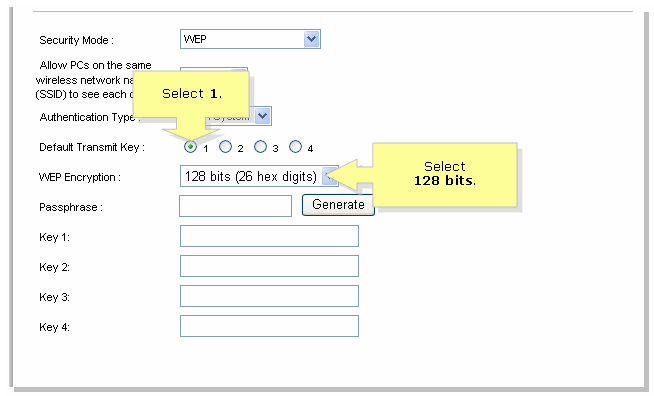 Select 128 bits under WEP Encryption. For Passphrase, type a wireless network password of your choice such as “MySecretKey,” then click Generate. NOTE: The passphrase is NOT your security key but rather a way for you to generate a password. You should come up with a word that is unique for your network and is a combination of numbers and letters up to 16 characters. The result will be a string of random characters. Copy the resulting string since this will be the key to your wireless network. NOTE: An alternative way to set up you password, instead of generating it, is to manually enter your security key into Key 1. Ensure to enter 26 hexadecimal digits where the letters may be from A to F and numbers may be from 0 to 9, respectively.